On Thursday, New York City learned that they will have an extra $3 billion to spend, as Amazon caved to the immense amount of public pressure placed on them, and announced that they would not be moving their HQ2 to NYC. New York promised to hand Amazon $3 billion in various tax breaks to bring its HQ2 to its city, but it turns out that plenty of state legislators and their grassroots supporters aren’t too keen on giving away billions to one of the most valuable companies in the world, run by the richest man in the world. 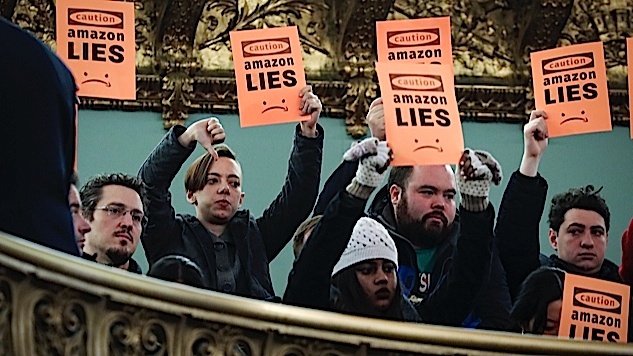 There’s nothing stopping Amazon from continuing its plan to expand to New York City, it’s just clear that the gigantic tax breaks they thought they squeezed out of the city are not forthcoming. There is a new generation of politicians who won’t sell out their city so they can gain a talking point about jobs. Jobs are good and politicians should focus on bringing more opportunities to their constituents, but “jobs at all costs” is not a coherent policy narrative. New York City is not hurting for work and opportunity, and there is absolutely no reason for the city to give away billions to a multi-billion dollar company because it’s bringing jobs. Amazon initially pitched HQ2 as a way to bring plenty of new jobs to an upstart city that needs them, like Austin or Nashville. Instead, after demanding every city give Amazon some level of unprecedented control, Amazon decided to split its HQ2 between New York City and the Washington D.C. area because that’s where the power is and this was never about helping any city other than the digital fiefdom that is Amazon. Billionaires don’t need to be given billions in free money. While that may sound like simple logic, one look at America proves that giving away public funds to the wealthy IS the policy in the United States. We are a wholly owned subsidiary of capitalists like Jeff Bezos, and for the first time in my 32 year life, it finally feels like the winds are shifting towards a more just and equal world.